So there’s this view circulating that the views I expressed about 15 years ago on the Bank of Japan are somehow inconsistent with our current policies. That is absolutely incorrect. My views and our policies today are completely consistent with the views that I held at that time. Now, looking at the current situation in the United States, we are not in deflation… So the — the very critical difference between the Japanese situation 15 years ago and the U.S. situation today is that Japan was in deflation. Before discussing ways in which Japanese monetary policy could become more expansionary, I will briefly discuss the evidence for the view that a more expansionary monetary policy is needed. As already suggested, I do not deny that important structural problems, in the financial system and elsewhere, are helping to constrain Japanese growth. But I also believe that there is compelling evidence that the Japanese economy is also suffering today from an aggregate demand deficiency. If monetary policy could deliver increased nominal spending, some of the difficult structural problems that Japan faces would no longer seem so difficult. Perhaps more salient, it must be admitted that there have been many periods (for example, under the classical gold standard or the price-level-targeting regime of interwar Sweden) in which zero inflation or slight deflation coexisted with reasonable prosperity. Alternative indicators of the growth of nominal aggregate demand are given by the growth rates of nominal GDP (Table 1, column 4) and of nominal monthly earnings (Table 1, column 5). Again the picture is consistent with an economy in which nominal aggregate demand is growing too slowly for the patient’s health. 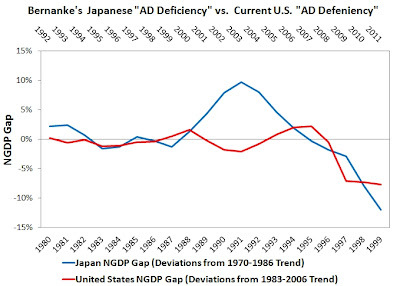 In short, Bernanke’s interest in the troubled Japanese economy was not motivated by deflation concerns, but by AD deficiency concerns. And by this criteria, the Bernanke Fed is not following Bernanke’s monetary policy prescriptions for Japanese monetary authorities. This can be seen in the table above that shows average NGDP growth in the United States since 2008 is similar to the low average NGDP growth rate in Japan over the time period covered in Bernanke’s paper. Moreover, the deviation of U.S. NGDP growth from its expected path in 2011 is not too different from the deviation of Japanese NGDP growth from its expected path in the late1990s. 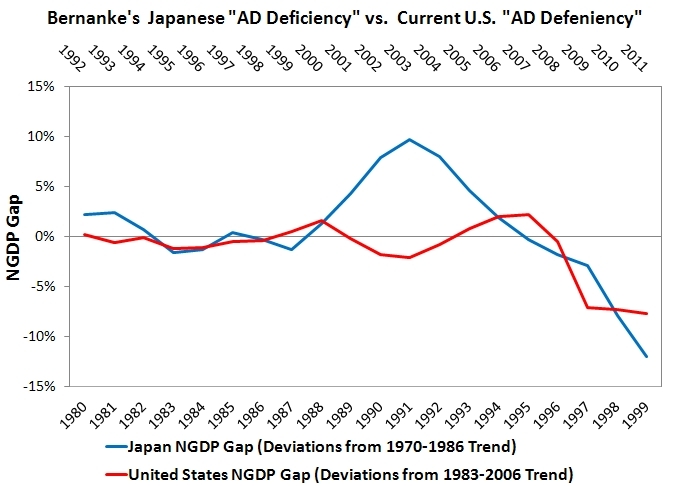 In other words, Bernanke’s Japanese AD deficiency problem in 1999 is very similar to the current U.S. AD deficiency problem. And contrary to the claims of some Fed officials, this current AD deficiency could be addressed without risking the Fed inflation-fighting credibility by adopting a price level or NGDP level target. Sigh. P.S. A big thanks to Binyamin Applebaum of the New York Times for asking Bernanke the question. One Response to "Bernanke: ‘Read My Lips, Not My Japan Papers!’"